Lake levels have dropped, & stabilized recently. This allows good access in the transition section near the inlet. A recently staged trout derby should leave above average numbers of catchable, & larger trophy sized trout around. The mud along the river bank can be extremely nasty after it thaws. It can be frozen on the surface; but will not support you when you walk on it during the mornings. Dry/dropper rigs are the hot ticket for trout sipping on midges, & mayflies in the transition section. Still water addicts can get their fix here all winter. This fishery is planted all winter, & can provide some excellent fly fishing opportunities from a float tube; or near the inlet section that feeds the reservoir proper. Full sinking lines fished along the steep shoreline drop-offs using patterns like Loebergs, Crystal Leeches, Parallel Punk Perch, Parallel Agent Orange, & Spruce-A-Bu’s are good calls for “freeze tubers” during the winter. 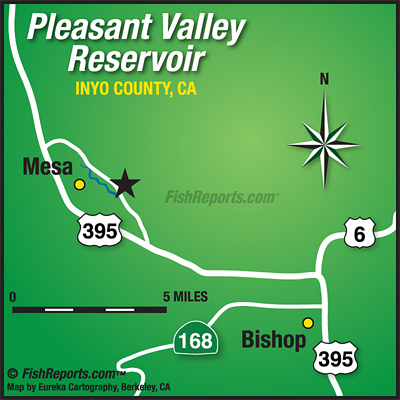 Locals call PVR “little Crowley” as fly fishers in the know will use still water nymphing techniques to score big numbers during periods of stable water levels. Set your “Under-Cators” to suspend those broken back midges, crystal tiger/zebra midges, gillies, & Assassins around the 12-14 foot depth. The inlet section is historically the most consistent section to fish. This diverse fishery also allows you to move into the short river section that feeds the lake. Looking much like the East Walker, this short; but sweet section has plenty of pocket water and riffles that hold holdover rainbows and browns that move into the heavy brush during periods of lower flows. Dry/dropper rigs using para hi-vis BWO’s, Stimulators, and hi-vis caddis patterns as your upper; with crystal tiger midges, crystal olive caddis larva, & parallel; or standard assassins as a nymph. The transition area that dumps into the lake has slower moving/deeper water that requires the use of an Under-Cator, or longer dropper off your dry. This is perhaps the most fertile area of the lake, & competent roll casters may get huge days here while making extended drifts in the foam lines. The trout will concentrate here to feed on the abundant chironomid, & mayflies that come off throughout the cooler months. Keep this fishery in mind if the weather gets nasty in the higher elevations.